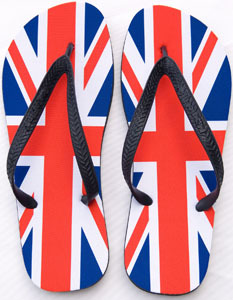 To Help celebrate anything British and with the upcoming 2012 London Olympics,Eyeswideart.com have launched patriotic Union Jack Flip Flops. We can Add text to suit you. Now selling Keep Calm and Carry On Deckchairs and Keep Calm and Carry On Mugs.